Stanford Superfly (3) over Whitman Sweets (5) by the score of 12-10 [8-6 half]. 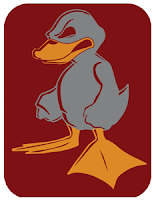 Minnesota Grey Duck (4) over Harvard Red Line (10) by the score of 15-12 [8-7 half]. Grey Duck are QUACKions, if you will. A condensed replay of the 2016 college ultimate championship "GAMES" will be rebroadcast on ESPNU with Evan Lepler and Ian Toner on the mic. Watch ESPN's category for ultimate continues to be "GAMES"
Neither the live streams on WatchESPN nor the TV listing include the teams playing. And, once again, the icon used in the show listing is a shirtless guy on the beach tossing a green Frisbee; N O T the sport of ultimate! Especially NOT the sport of championship college ultimate. Watch and support USA's finest ultimate players as they prepare locally in the DC-area for 2016's World Ultimate (& Guts) Championships. INFO: On Memorial Day (Monday), the men's, women's, and mixed US National Teams are scheduled to participate in intra-team scrimmages. Support your national teams and watch some of the best players in the world! WARNING: Road closures are possible due to Rolling Thunder Memorial Day Parade. 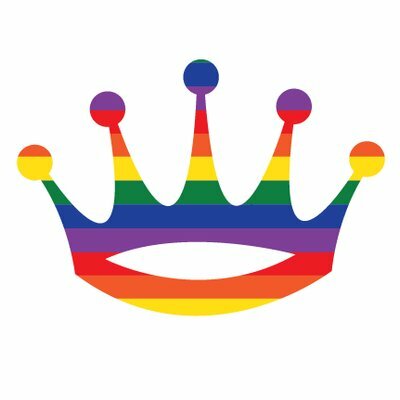 Metro running on Sunday schedule today. 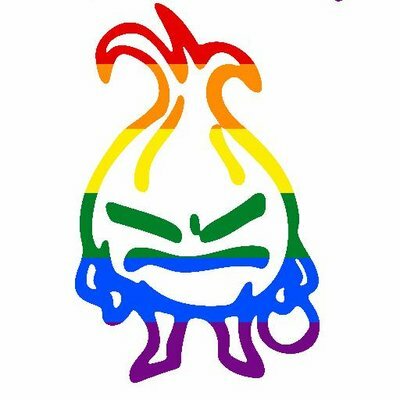 In addition to USA Ultimate's voicing anti-HB2 sentiments, college ultimate teams that have traveled to North Carolina to play in USA Ultimate's College Championships are supporting the fight against HB2 (or pro-LGTBQIA+) in North Carolina in colorful ways. Oregon Ego's stance is simple yet blunt. 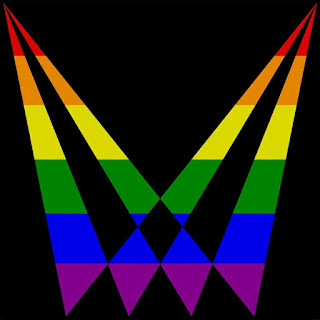 RELATED: Rainbowfied ultimate team logos . Austin Sol's rainbow effect. NOTE: This is an non-comprehensive list. Happy to update as appropriate. In today's first round of USA Ultimate's College Championship, Oregon Ego played Case Western Reserve Fighting Gobies (18) in Pool B of the Men's Division. Case Western just took a 1-0 lead on Oregon...and kinda celebrated like they won a national championship. The Fighting Gobies played well with a 3-point lead into half (8-5), and continued to lead 12-10 at the soft cap. And, then Oregon Ego took over and scored the next and final 4 points to win the game. The final was that the favored team won by 2 goals. The game could, rightfully yet simply, be reported as Oregon won 14-12 over Case Western Reserve. But excluding the halftime score - or even the score at the soft cap - would miss out on what was an exciting game that some labelled as an "upset alert." 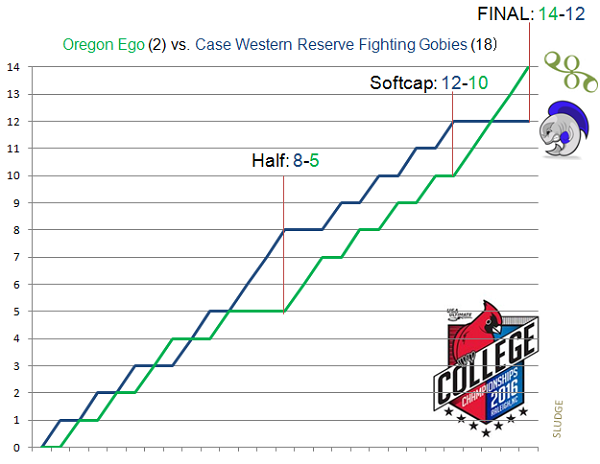 "Oregon win over Case Western Reserve 14-12 (5-8 half)" is a much better report of the game score by providing context of how Ego overcame a halftime deficit and dominated the 2nd half outscoring Case with 9 goals to 4 goals. USA Ultimate's Division-I College Championships start today in Raleigh, North Carolina. 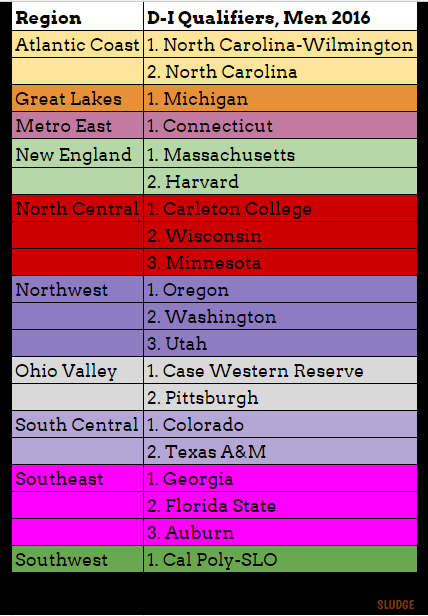 College ultimate teams from 19 different states and 2 Canadian province will be represented at USAU 2016 College Nationals. The state of California leads with representation of 5 college ultimate teams - Cal, Cal Poly-San Luis Obispo, USC, Stanford and UCLA - playing at this year's Nationals, followed by Washington state (4 teams) and Colorado (3 teams). 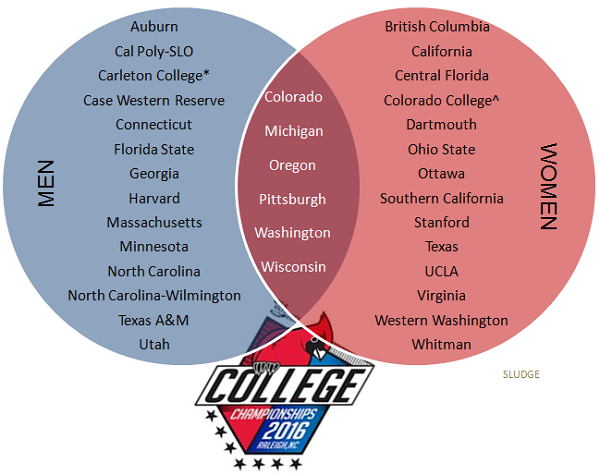 Ten states have representation of 2 college ultimate teams. There are six (6) D1 schools represented by both the men's and women's ultimate teams. Can you guess the D1 college ultimate teams from their alphabet logo letter? 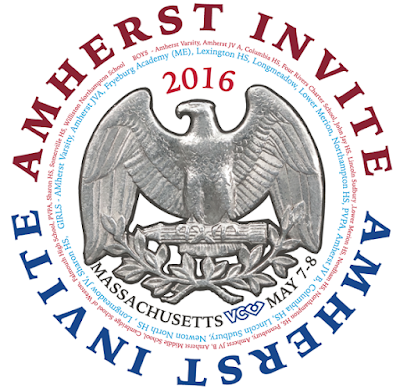 HINT: Logos are from one of the 40 teams competing at USA Ultimate Division-I 2016 College Championships. Yes, some creative liberty was used to complete the alphabet. The World Flying Disc Federation published a fact sheet on Game Advisors. 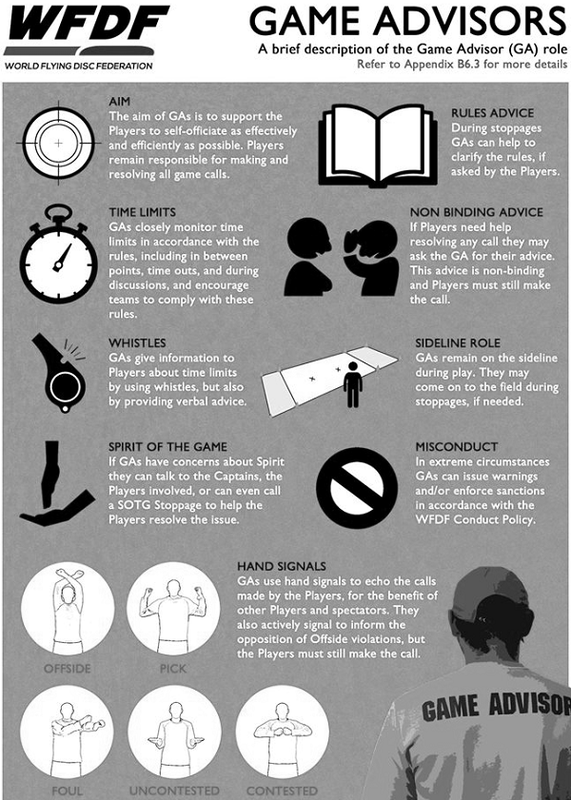 Game Advisors have whistles whose purpose is to support ultimate players self-officiate as effectively and efficiently as possible. 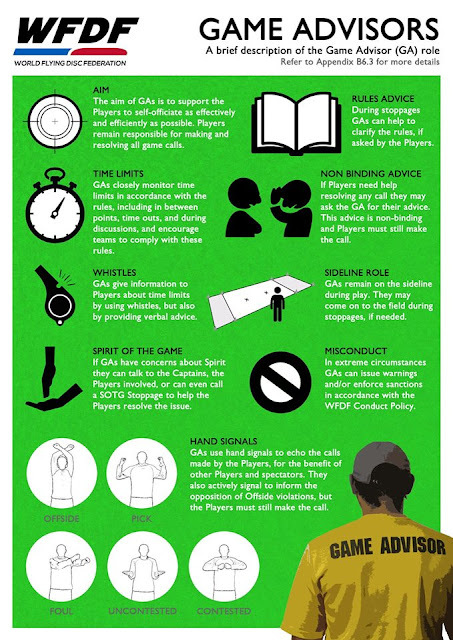 GA can help clarify rules if asked and will mirror calls made by players with visual hand signals to help other players as well as spectators. The white font on bright green is a poor choice for readability. I updated the coloring to (hopefully) help with legibility. 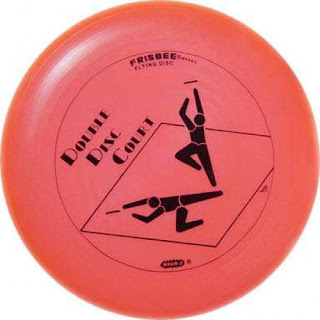 By trademarking the name Frisbee, it can be used only for the flying discs made by Wham-O. 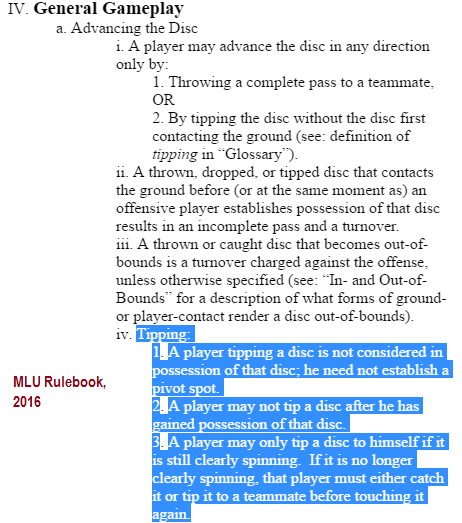 Brushing the disc, or "tipping" (as MLU refers to it), is allowed in Major League Ultimate gameplay. At the end of the 3rd quarter of DC Current's game versus New York Rumble, Delrico Johnson (#4) smartly tips the spinning disc for a 25-yard interception. WATCH & listen to the full play. Commentator Glenn Poole referred to the play as "The most exciting defenses in some time." Broadcaster Laura Perkins adds: "Wow! If you didn't see that, you are going to want to see that again." 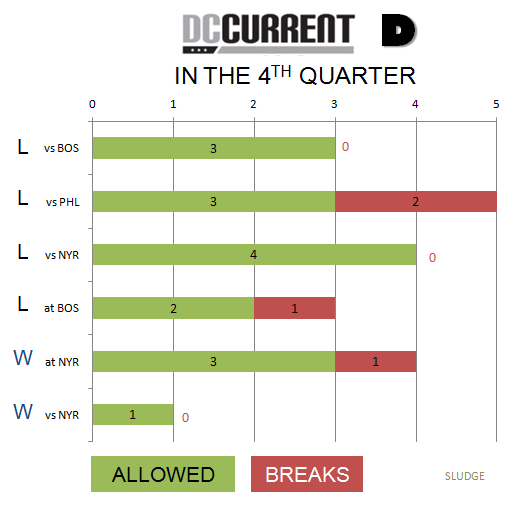 The D.C. Current won Saturday's game 17-16 (11 -7 half) against New York. 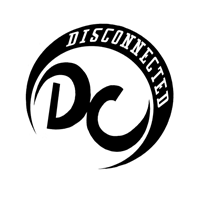 After a 4-game losing streak, the D.C. Current are now (2-4) on the 2016 MLU season. 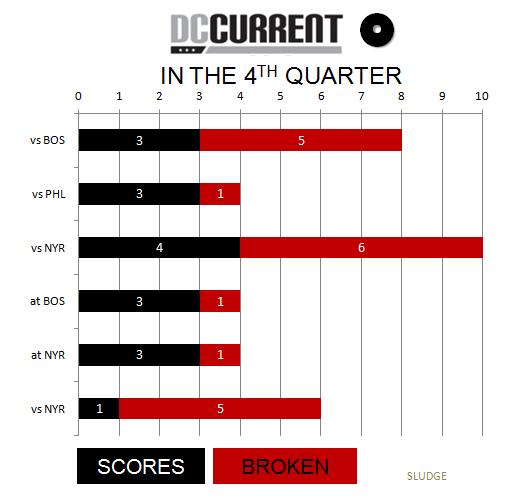 In 6 games, the Current's offense averages 3.5 goals yet gets broken at a rate of 3.2 goals, while DC's defense allows 5.8 goals but only generates <1 (0.7) break goal per game in the 4th quarter. 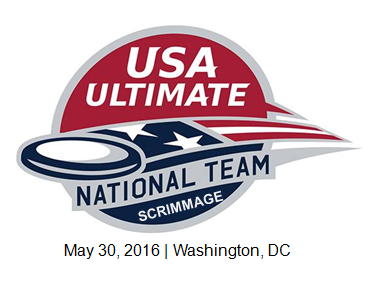 A total of 40 D-I college ultimate teams qualified for USA Ultimate's 2016 College Championships. Of the 20 qualifying men's college teams and 20 qualifying women's college ultimate teams, there are 6 schools that are sending BOTH their men's & women's college ultimate teams. They are: Colorado, Michigan, Oregon, Pittsburgh, Washington and Wisconsin. The D-III event is scheduled for May 27-30 in Raleigh, North Carolina. 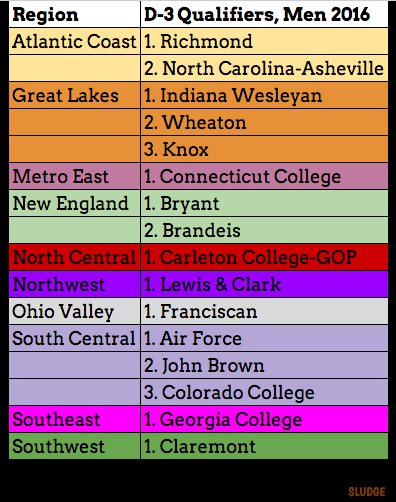 * = Carleton College's DI women's team (Syzygy) did not qualify, but their DIII women's team qualified for (& won) the D-III championship. ^ = Colorado College's men's ultimate team played in the D-III championship. Carleton College Eclipse (8) over Rice University Torque (2) by the score of 11-10 [8-4 half]. Georgia College Disconnected (9) over Brandeis TRON (7) by the score of 13-11 [6-8 half]. So, two of the 3 schools whose men's AND women's teams qualified won ultimate championships. The other school - Claremont - tied for 7th in Women's & the Men's team tied for 13th. 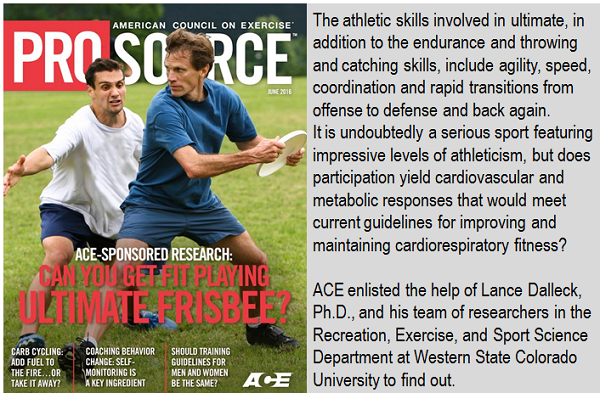 The lead story in American Council on Exercise (ACE) June 2016 magazine is: Can you get fit playing ultimate Frisbee? The study led by Lance C. Dalleck, Ph.D. was conducted by Western State Colorado University researchers to evaluate the health benefits of ultimate. tldr: Yes. Playing ultimate is exercise. Study abstract: The athletic skills involved in ultimate, in addition to the endurance and throwing and catching skills, include agility, speed, coordination and rapid transitions from offense to defense and back again. It is undoubtedly a serious sport featuring impressive levels of athleticism, but does participation yield cardiovascular and metabolic responses that would meet current guidelines for improving and maintaining cardiorespiratory fitness? ACE enlisted the help of Lance Dalleck, Ph.D., and his team of researchers in the Recreation, Exercise, and Sport Science Department at Western State Colorado University to find out. Study population: 16 healthy and physically active young adults between 18 and 25 years of age to play eight ultimate matches lasting 40 minutes each. Researchers equipped participants with a calorimetric measurement system, a heart rate monitor and a GPS unit to record distance travelled while they played. In addition, peak blood pressure was measured in all participants at the end of the match and then every 30 minutes for the 90 minutes post-exercise. Study results: The study revealed that ultimate burns an average of 477 calories per match and elicits training benefits similar to those observed with moderate- to vigorous-intensity exercise, such as running at five miles per hour. Data showed cardiovascular benefits comparable to traditional interval workouts, as ultimate players regularly switch from full sprints on offense to jogging back to defensive positions. These findings indicate that ultimate, played three times a week, is an excellent tool in meeting the physical activity guidelines recommended by the U.S. Department of Health and Human Services. One of the most commonly overlooked elements of a fitness program that drives long-term adherence is the fun factor, and ultimate certainly provides more than its fair share of fun. 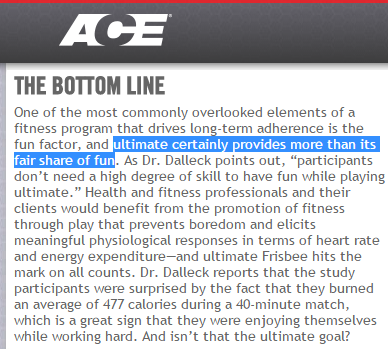 As Dr. Dalleck points out, "participants don't need a high degree of skill to have fun while playing ultimate." Health and fitness professionals and their clients would benefit from the promotion of fitness through play that prevents boredom and elicits meaningful physiological responses in terms of heart rate and energy expenditure—and ultimate Frisbee hits the mark on all counts. Dr. Dalleck reports that the study participants were surprised by the fact that they burned an average of 477 calories during a 40-minute match, which is a great sign that they were enjoying themselves while working hard. And isn't that the ultimate goal? "We found that playing ultimate offered an effective and natural form of interval training that improved cardiovascular health and lowered post-exercise blood pressure," says American Council on Exercise Chief Science Officer Cedric X. Bryant, Ph.D. "In addition, many participants were surprised to learn how many calories they had burned while simply playing." Read the full published study. Congratulations to H-B Woodlawn for winning USA Ultimate's 2016 Southern High School Regional Championship in the Girls Division. The girls varsity ultimate team from the Secondary Program based in Arlington, Virginia, goes by the name of Pandamonium. 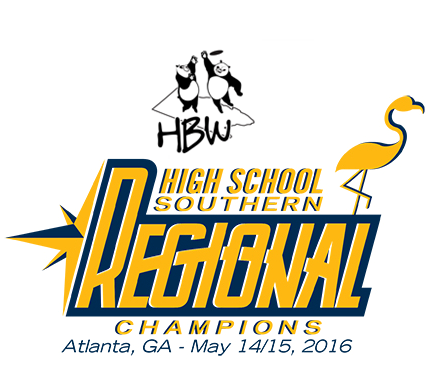 The HB-Woodlawn girls ultimate team entered the tournament in Atlanta as the 4th seed. HBW Pandas went (3-0) on the first day of the tourney including a 10-8 victory over the 2nd-seeded Carrboro (North Carolina) High School team. In Sunday's bracket play, HBW faced off with a familiar opponent - Arlington's Yorktown/Washington-Lee YLee Coyotes, which HBW won by 10-9 (6-7 HT). HBW took down East Chapel Hill (N.C.) High School by 4 goals (10-6) in the semifinals, and then faced the #1 seeded team Paideia School from Atlanta, Georgia. Both teams entered the finals of High School Southern Regional undefeated at (6-0). HB-Woodlawn won the championship against the defending champions by the score of 8-6. 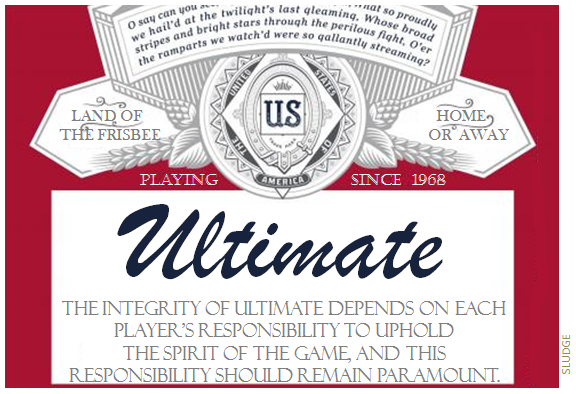 Read USA Ultimate's more detailed recap. its 2 seniors on the team - Maddy Boyle and Agnes Cheng. Congratulations to all Pandamonium players: Miranda Baltaxe, Katie Franz, Nicole Getter, Kaiya Gordon, Ellie Heil, Ava Jones, Ella Juengst, Bryn Kabiri, Caroline Kassir, Kirsten Knisely, Julianne Meany, Maya Nir, Maura Shapiro, Franci Swisher-Gomez, Caroline Tornquist, and Juliana Walker. The boy's HB-Woodlawn ultimate team were also successful with 3rd place (tie) finish at Southern Regionals. 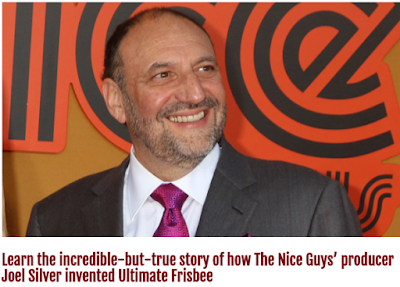 Joel Silver (producer of the new film The Nice Guys)is an alum of Columbia High School where the first rules of ultimate frisbee were developed. "I like to say we developed it." "I went one year to Mount Hermon...prep school. One summer, there were a couple guys there from Amherst and Amherst was the location of a place called [The Frisbie Pie Company]. They made these metal pie tins, which is what they first started throwing around there in Massachusetts.... There was kind of a game that they played at Amherst since the '50s that had elements of a kind of run and catch game, which I was taught there that summer. Then I brought it back to my high school." "As a joke one day — because it was a kind of counter culture time — I had raised my hand in my student council and I say, 'I'd like to move that we have a committee to investigate the possibility of bringing frisbee into the high school curriculum.' I mean, it was a joke. I didn't expect to have a committee to investigate playing frisbee, so we kind of started playing this game and they just had built that parking lot, which is down the street. They decided to light it at night, because they didn't want a dark, empty parking lot there. They lit it all night, so we had a place to go and we'd come at the end of our evening and we'd all collect there and play this kind of game that we started playing." "It was popular. 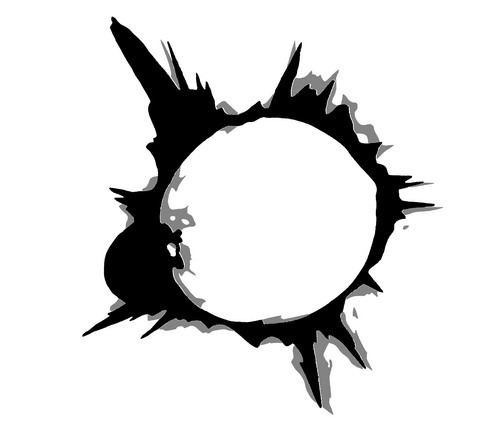 People would come and hang out and play this game. We'd play in the winter. It was fun and, by the end of that school year, we played the student council." To show what the committee did, I decided to put the rules on paper and so we wrote up the rules. There was a game then they used to play that Wham-O had put out called 'Guts Frisbee.' It was the dumbest games in the world. You stand there across from each other and throw the frisbee as hard as you can at the other team. It's called 'Guts Frisbee.' Dumbest game. So when my friend who wrote the rules wrote it, he called it ‘Speed Frisbee’. I said, "You can't call it 'Speed Frisbee'! That's as dumb as Guts Frisbee! Let's call it "Ultimate Frisbee." The Ultimate Frisbee, that's what well call it!" So we typed it up, put it in, submitted it, and that was the game." 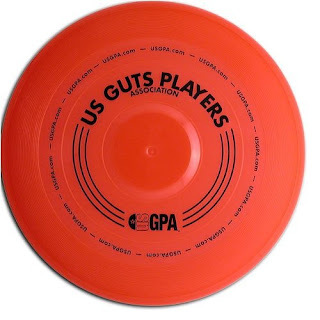 Guts 110-gram Wham-O Guts Frisbee #15 mold with a raised central "cupola"
Guts and Double Disc Court. Also, Wham-O is one of many, many, many WFDF-approved disc golf discs. 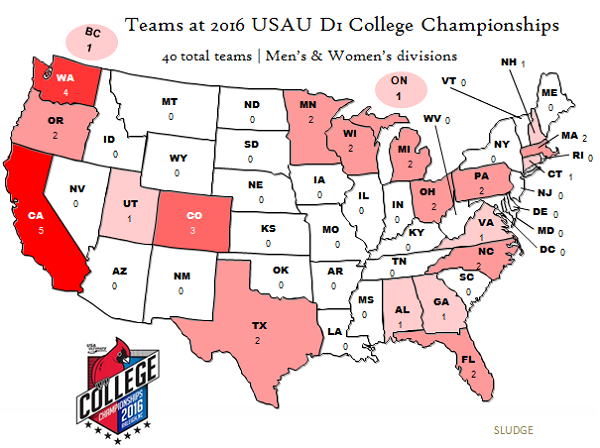 A total of 32 D-III college ultimate teams qualified for USA Ultimate's 2016 College Championships. 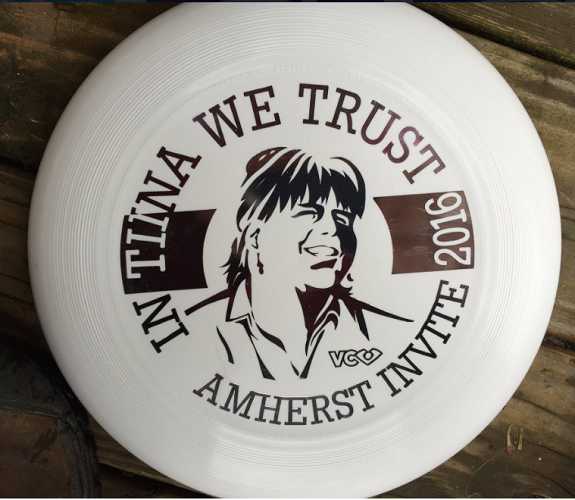 Of the 16 qualifying men's college teams and 16 qualifying women's college ultimate teams, there are 3 schools that are sending BOTH their men's & women's college ultimate teams. They are: Carleton College (Northfield, Minnesota), Claremont (Claremont, California), and Georgia College (Milledgeville, Georgia). The D-III event is scheduled for May 21-22 in Winston-Salem, North Carolina. Congratulations to Opig for winning the 2016 National Beach Ultimate Championship in the Mixed Division! Opig from Arlington, Virginia, won its pool with a perfect (4-0) record on May 14th. 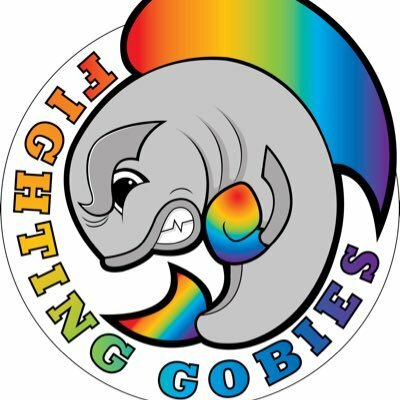 Opig beat Beachboat 12 - 9, Squirtle Squad 13 - 5, Big Fish 13 - 3 and finished the day with a 3-point win against comic sands in the evening's showcase game. Their success on Saturday gave them a first-round bye into Sunday's bracket play. In the quarters on May 15th, Opig won a 1-point game versus San Francisco's Fog City. Their next game was against last year's runner-up No Tsu Oh. Opig topped the Houston team by the score of 13-9. Then in the USA Ultimate Beach Championship Mixed Division finals, Opig won 13-8 (7-4 HT) versus the #1-seed Los Angeles Break Point. Opig's win avenged their loss to Point Break in last year's semifinal. Opig finished the beach ultimate tournament with a perfect (7-0) record, was the only underdog (lower seed) to win in their division's finals, and earned a championship trophy. Opig is captained by Jenny Fey, Ashley Daly, Ryan Morgan. Congrats to the entire Opig team: David Cranston, Katie Klein Shepley, Colleen Giglia, Nate Castine, Crystal Davis, Adam Simon, Brian Marshall, Andrea Duran, Luke Wolckenhauer, Nicky Spiva, Jeff Wodatch, Hannah Boone, and Kelly Hyland. 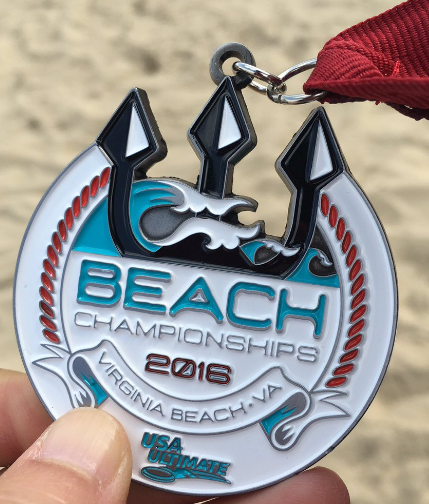 A total of 65 beach ultimate teams competed at this annual beach ultimate event hosted by USA Ultimate. Opig beat out 18 other teams within their division to win the Beach Mixed championship. Another D.C.-area team also advanced to the finals in another division. Over the Hill, captained by Peter MacArthur and Eric Hartge, placed second in the Masters Mixed Division of the 2016 USA Ultimate Beach Championship. 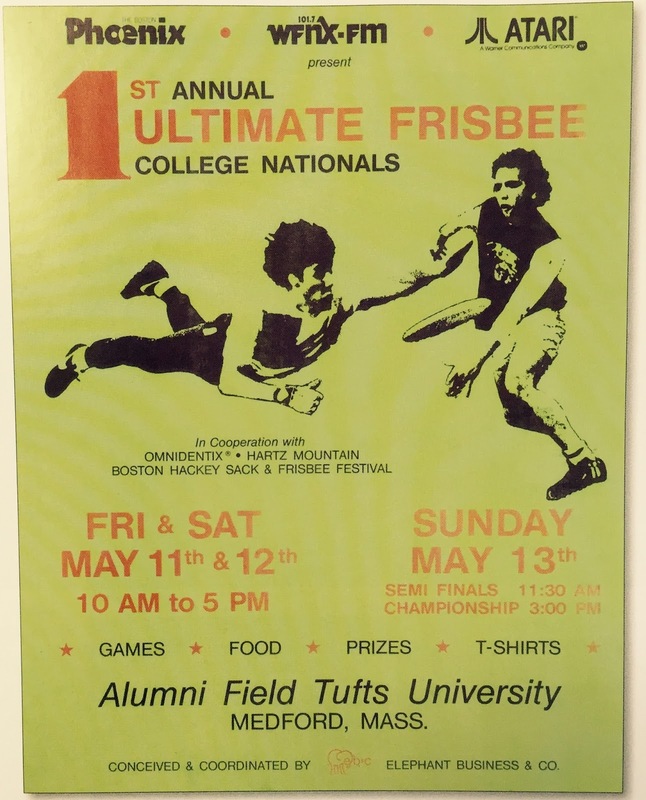 On this day in ultimate history in 1984, the first-ever College Nationals was played at Tufts University (Medford, Massachusetts). Stanford won the 1st annual Ultimate Frisbee College championship over Glassboro by the score of 21-18. 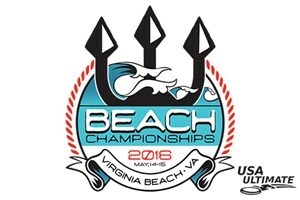 The second annual USA Ultimate Beach Championships Virginia Beach, Virginia, starts this weekend. USA Ultimate is hosting 65 teams in 5 divisions - Grand Masters, Men, Mixed, Mixed Masters, Women - hailing from 22 different North American states/province/territory. North Carolina is represented the most with 9 teams. Massachusetts, New York and Virginia each have 5 teams competing at this year's Beach Championships. North Carolina is the only state to be represented in all 5 divisions; GM: Alchemy and Grave Error, MEN: Right Coast, MIXED: Donkey Play, MIXED MASTERS: Swamp Rats, Ye Olde Boxcar, WOMEN: First in Flight, Retro, Sharks & Kisses. There are 10 teams (15% of all beach teams) from west of the Mississippi River that are scheduled to appear; they are from California (3), Iowa (3), Colorado (2), Texas (2). There are 2 teams from outside of the United States - both from Toronto, Ontario - competing at USAU Beach Championships. Locations based on published locations. It is understood that some teams may roster players from different states. Below is another concept for Budweiser's renaming promotion. What is more American than playing ultimate? 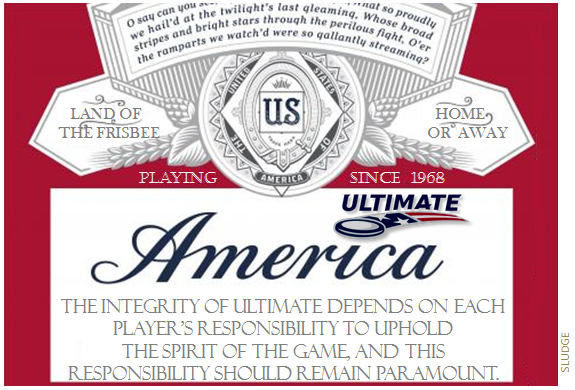 Under the influence of Budweiser "beer" renaming summer brews to America, here's a concept if Budweiser were to transform their label to the governing body for the sport of ultimate in the United States. RELATED: The "ultimate" six pack. The MLU Shop is now selling a Current shirt that rings true for every D.C. home game. Info: Designed and made by Canterbury this is the must-have grey, cotton shirt for supporters of the Washington DC Current. 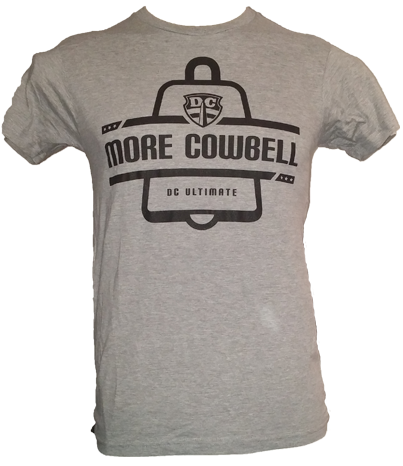 See below for the actual cowbell the shirt alludes to and the classic SNL reference. These fan noisemakers were first distributed to D.C. fans starting in 2014. Looking at just the cities with two teams in the pro ultimate leagues, what are those 6 teams' combined records so far? San Francisco FlameThrowers (6-0; AUDL) and Philadelphia Spinners (5-0; MLU) are the only undefeated teams on this city list. 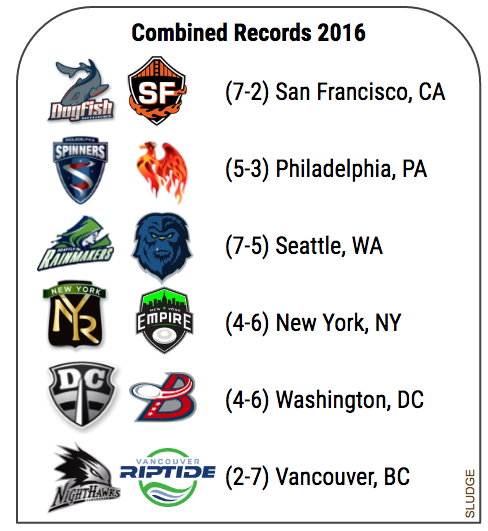 Vancouver Nighthawks (0-6; MLU) and Philadelphia Phoenix (0-3; AUDL) are both winless. At a combined (7-5) — Rainmakers (3-2; MLU) and Cascades (4-3; AUDL) — Seattle is the only city with both pro ultimate teams with a winning record. She was a teacher at Amherst Regional High School and used to coaching ARHS' varsity boys ultimate team. 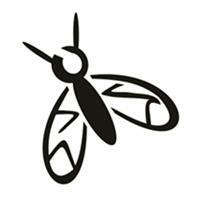 For tourney results, visit their Facebook page. A total of 36 men's college ultimate teams have qualified for USA Ultimate College Championships - 20 teams in Division-I and 16 teams in Division-III. USAU College Championships will take place May 21-22 for D-III May 27-30 for D-I. 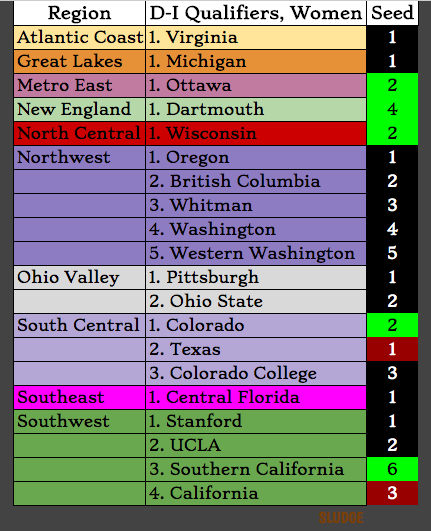 Below are the D-1 & D-3 lists of men's college ultimate teams that qualified for Nationals by region. View the list of qualifying women's college ultimate teams. 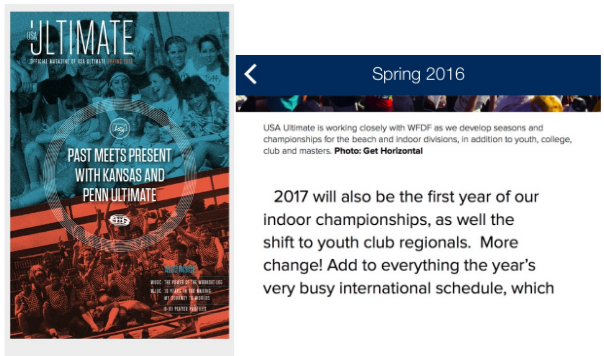 In the spring 2016 issue of USA Ultimate Magazine, the theme of Dr. Tom Crawford's Letter to our Members is unpredictable change and also announces a new surface/competition division for next year. USAU CEO Crawford writes: "I believe anyone who thinks they know what this sport will look like in five years is full of malarkey." More details on the new indoor ultimate competition series: "The indoor season will obviously fall in the winter months. We are excited about introducing another new playing opportunity and we are working with WFDF on the planning....the indoor discipline creates an enormous opportunity at the youth level." 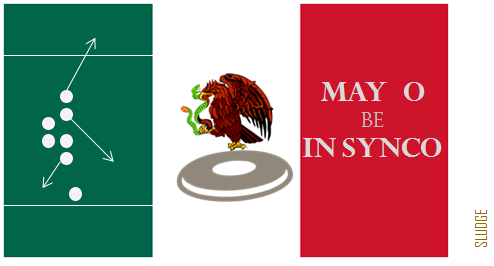 may O be in synco. Twenty women's college ultimate teams qualified for USA Ultimate's Division-I Championships. Here's a recap of what happened at last weekend's regional events. 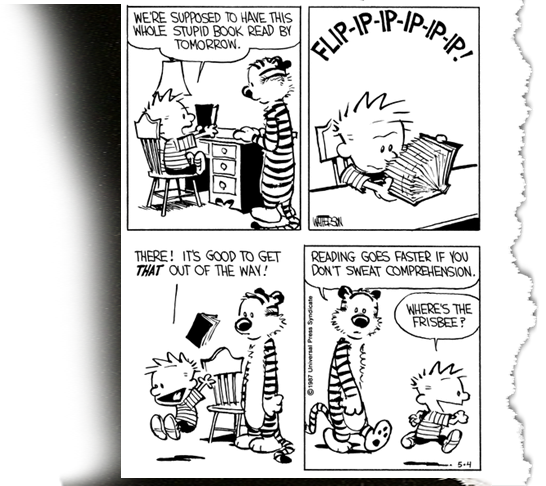 Anniversary of Calvin asking Where's the Frisbee? 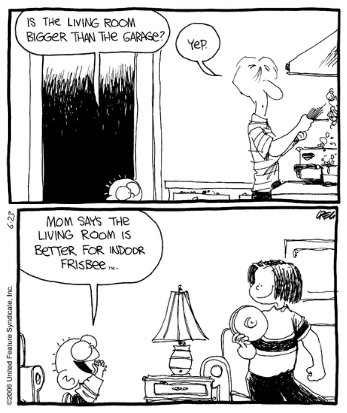 Today marks the anniversary - published on this date 29 years ago - of my favorite comic strip of all-time. 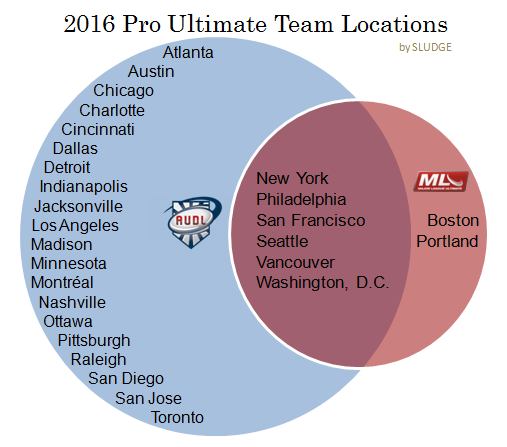 The 26-team American Ultimate Disc League and the 8-team Major League Ultimate share 6 cities giving pro ultimate fans a total of 34 pro ultimate teams in 2016. The total team list in 2016 is 1 more than last year's eventual total.